This was my third visit to Worlington, out on the edge of Suffolk where it starts to get nice as you leave Mildenhall's gloomy orbit. The first occasion I'd been here was in 2003, comletely oblivious to the fact that my camera's aperture had developed a fault, and all the photographs I took in here (and also those I'd already taken at those two giants, Lakenheath and Mildenhall) would not come out. This village seems to have been reasonably prosperous at all periods; the photograph above shows the late 13th Century Decorated chancel, and the late 15th century clerestory and aisle. There are earlier lancets on the north side. But the big deal, as you may have noticed, is that All Saints retains a sanctus bell turret, used to suspend the bell that rings out at the consecration of the Mass. The bell still exists, but is in Moyse Hall Museum in Bury. I came back on Historic Churches bike ride day in 2003. And here's the curious thing. I pottered about inside and out, taking photographs, and then moved on to Beck Row. But there, the replacement camera I'd bought in 2000 also gave up the ghost. This means that Worlington church was the last place I ever used a film camera. It would all be digital from now on. 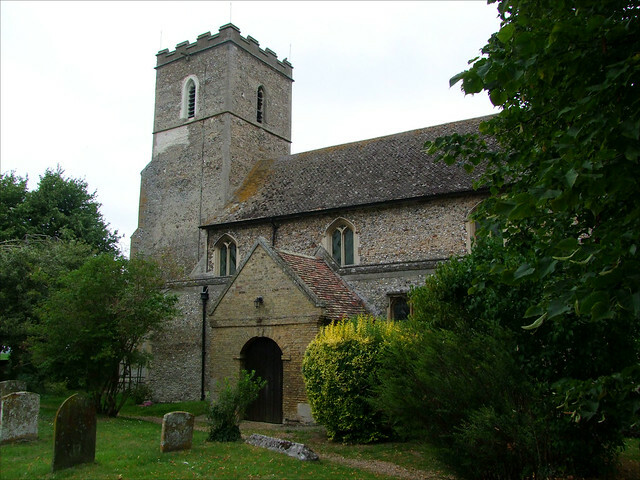 Worlington is in one of the few corners of East Anglia where they lock their churches, but the very friendly keyholder lives in the house next door, and when we came back in the summer of 2011 she heard our voices in the churchyard, and she came out with the key to us. I remembered liking this church a lot, and I wasn't disappointed. Like its neighbour Freckenham it is a fairly quirky interior, and all the more memorable for this. The Norman font is pressed against a pillar of the south arcade, a position which appears to have been conventional before the middle medieval period, and on the pillars of the arcade are fascinating graffiti from down the centuries. Below the capitals, the pillars are decorated with pointed head arches, and you can see eaxctly the same thing a couple of miles off at Lakenheath. There are some good monuments, the best of which is the 1822 memorial to Rice James, and some medieval glass in the upper lights. There is a splash of Elizabethan wall painting beside the chancel arch, presumably intended to decorate an improving text designed to turn the people's heads away from Catholicism. Most memorable of all, I think, is the ticking of the parliamentary clock which made sure that 19th Century Worlington kept pace with London.